A high-level delegation from the Abu Dhabi Fund for Development, ADFD, attended Thursday the inaugural ceremony of the $2.3 billion landmark infrastructure project of a high-speed train service connecting the cities of Tangier and Casablanca in Morocco. 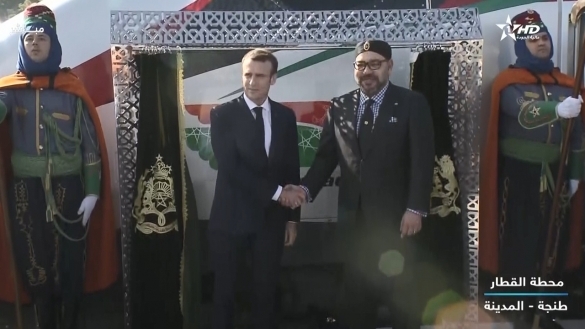 Inaugurated by King Mohammed VI of Morocco, the launch ceremony was also attended by French President Emmanuel Macron, Sheikh Sultan bin Tahnoun Al Nahyan, Member of the Executive Council of Abu Dhabi, Ali Salim Al Kaabi, UAE Ambassador to Morocco, Mohammed Saif Al Suwaidi, Director-General of ADFD, and several high-ranking Moroccan officials, reported the UAE news agency WAM. ADFD’s contribution to the 200-km long, 320-km/hr high-speed train amounted to $140 million (AED514 million). Through linking the two cities and reducing the travel time to two hours, this important infrastructure project will bolster the movement of people, increasing nationwide and cross-city trade and tourism as well as driving sustainable economic development. The Fund has so far funded 12 transportation projects worth an estimated AED2.4 billion ($650 million) to support socio-economic development in Morocco. To date, the Fund has supported Morocco with grants and concessionary loans worth AED9 billion across 82 development projects spanning diverse sectors, including housing, water, agriculture, education and healthcare. Several other Arab funds co-financed the project, namely the funds of Saudi Arabia (€144 million), Kuwait (€100 million), and the Arab Development Fund (€86 million). Written by: Jaber Ali on November 16, 2018. Posted by Jaber Ali on Nov 16 2018. Filed under Gulf News, Headlines, World News. You can follow any responses to this entry through the RSS 2.0. Both comments and pings are currently closed.